As is my nature, I can consider myself an authority on any subject while in command of the least bit of knowledge. 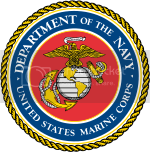 So, before I met my husband, who was Active Duty U.S.M.C., when we met, I thought I knew all about military sacrifice and service. After all, my father had left college when he was drafted into World War II. My parents waited to get married until after the war and when they did, someone gave my mother ration coupons so she could get a new pair of shoes for the wedding. Then, when I was eighteen months old, my father was recalled into the Korean War, they put all of their possessions in storage, rented out our house, plopped me in the car and headed out to Travis Air Force Base in California for two years. Hearing this story regularly over the years, I thought I understood what it takes to be in the military, but I was wrong. 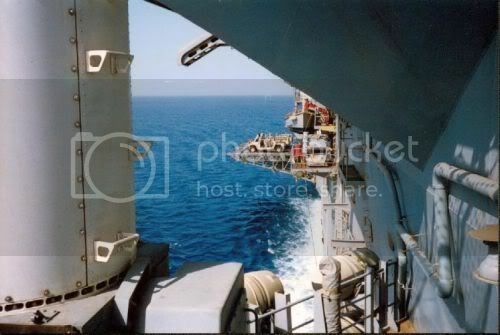 Underway on the open ocean during the Persian Gulf War, 1990.
retired, decommissioned 25 August 1998. Before I moved to the Marine Corps Air Station when I got married, I was unaccustomed to understanding just how young our “forces in readiness” really are. Sure you have many older men and women, those thirty years and above, but so many kids join right out of high school, that when you ride through the Camp, you see mostly young men eighteen to twenty three along with a representation of similarly aged women, so the average age is about twenty one. Twenty one? Are you kidding me? Most of the Marines one sees, representing our forces ready to deploy on short notice, are an average age of twenty one? The thought of all these young men and women, many with full blown families going to fight with uncertain futures, paralyzes me. 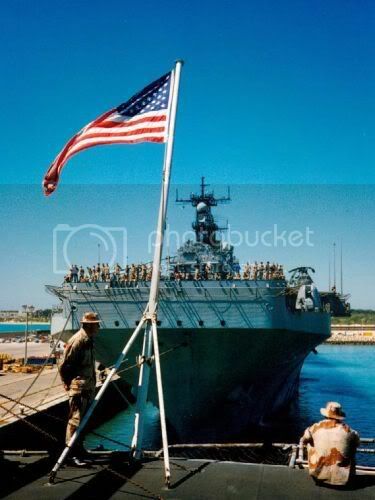 And, I haven’t even mentioned the separations involved when my husband’s Squadron went on “floats” or sailed out as part of a MEU or Military Expeditionary Unit of five Navy Ships, 2,000 Marines and a Squadron for air support. When that happened, we didn’t get to see each other for six months at a time. SIX MONTHS at at time. Think of it. I don’t know how I made it. And, yet, I still didn’t know what military sacrifice is. USS Nassau as seen from the USS Guam in port. Last week, when I was an Election Judge serving in Maryland for the General Election on November 6, 2012, I finally learned what military sacrifice is. I was verifying voter’s registrations as they came in the door to the voting area after standing in line, sometimes as long as two hours. An older gentleman in a companion chair, a chair with wheels that is meant to be pushed by a companion, rather than self propelled by the sitter as in a wheel chair, was pushed up to my table. Many were waiting. “Why, YES! I’m a Marine. My father was a Marine, my wife was a Marine and my son was a Marine. And they’re all DEAD.” Taken aback, I couldn’t let it end there.